With all of the hullabaloo over guaranteed appointments possibly still being in effect, I find myself conflicted. On the one hand I really am against ending guaranteed appointments without defining what we mean in terms of effectiveness (see my posts on accountability, power, and general thoughts on guaranteed appointments). So it should be good news on one level. If guaranteed appointments are still in effect, we will have more time to prayerfully discern the best way to move forward with ending them, if that is what God is calling us to do. On the other hand, it scares me that General Conference could go to the trouble of ending guaranteed appointments and fail to do it. Superficially the Conference raised the stress levels of already unhealthy pastors unnecessarily. More problematic is what I perceive as the lack of intentionality and discernment. How important was ending guaranteed appointments if no one bothered to ensure all the language in the Book of Discipline was changed? If the General Conference had allowed holy conferencing on this topic, would someone have brought to light the fact that the legislation was insufficient? The lack of intentionality pervades our church. It reminded me of an incident at my Annual Conference. We had a new proposed structure up for discussion. Our vision task force for the conference presented their recommendation. A polity professor suggested we should amend the first part of the recommendation to make it inline with the Book of Discipline. Another pastor asked for a declatory decesion by the bishop so that the Judicial Council could weigh in (although by changing our structure this will probably have to happen anyways). A vision team member suggested the recommendation was in two parts: a report and a resolution. He suggested only the resolution mattered. The vision team member basically dismissed all the conversation related to the report. After an unplanned recess to sort the matter out, we finally approved the vision. Not enough time had been planned for the discussion though. So for the rest of conference we were rushed. While I found the incident deeply problematic on several levels, what bothers me the most is I felt like we were not intentional in presenting the best legislation possible. If the vision was important, we would want to make sure all aspects were right given our limitations. We would have scheduled enough time to discuss it. The report that the resolutions depended on would have been fair game to amend. Instead, I felt like we just wanted to pass it and move on to the next agenda item. Local churches lack intentionality too. We rarely define what we expect or want. The United Methodist Church tells us our mission statement is to make disciples of Jesus Christ for the transformation of the world. In my experience though, we rarely define what we mean by disciple. In turn, we do not have good metrics for discipleship or even define a discipleship process. By default then, we focus on the easy: facts, figures, and finances. I believe we need to be intentional if we want to be followers of Jesus. We are called to follow, but we need to be intentional in our response. Methodists were very intentional once. We had classes, meetings, societies, accountability, and goals. The early Methodists strived for Christian perfection and to flee the wrath to come. At their best, they were intentional about their discipleship. Hopefully when the dust settles, we will rethink how we do General Conference. This scare might invite us to be more intentional on all levels of the church. Perhaps we will spend more time discerning and less time rushing. If it is important, we should want to invest time into it. If it is not worth the time, it is probably not important and would be best left alone. 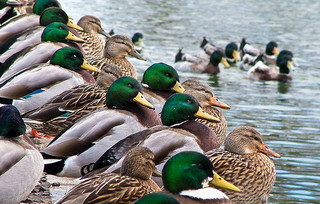 “duck life.” ©2009 Copyright katdaned. Licensed Under Creative Commons. Previous Previous post: Claiming the Spirit?